The next chapter in the Daily 5 that we are covering is Chapter 7: When to Launch The Next Daily 5. However, nervous or not, I know that my students will be able to be successful using this program. I am reminding myself these few things while I begin to wrap my head around launching Work on Writing in a kindergarten setting. 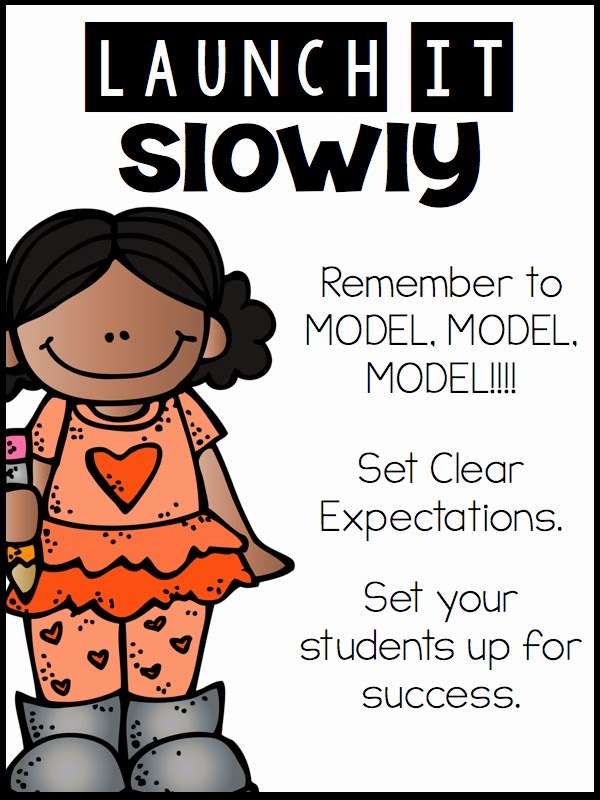 In first grade it was ESSENTIAL to model, model, model and then MODEL some more. 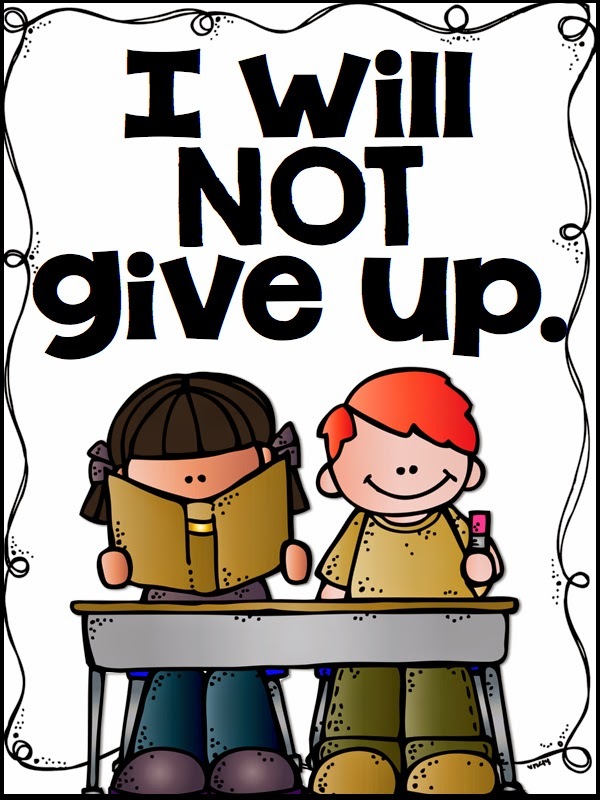 I know that this will be true as I move to kindergarten. Our young learners need to SEE exactly what is expected of them. 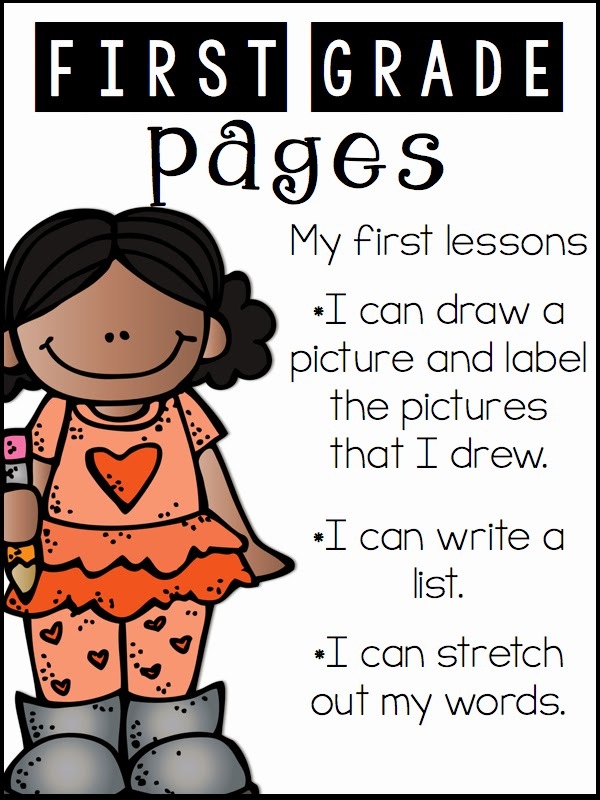 In Kindergarten, my very first writing lesson will talk about how important the pictures are when you are writing. 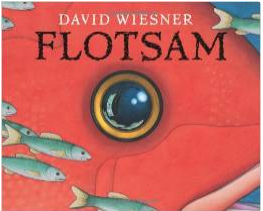 I love the book Flotsam and have used it every year when I launch “read the pictures” to my classes. We will revisit this book during this lesson. This time we will look at the pictures and talk about how they convey the meaning of the story. 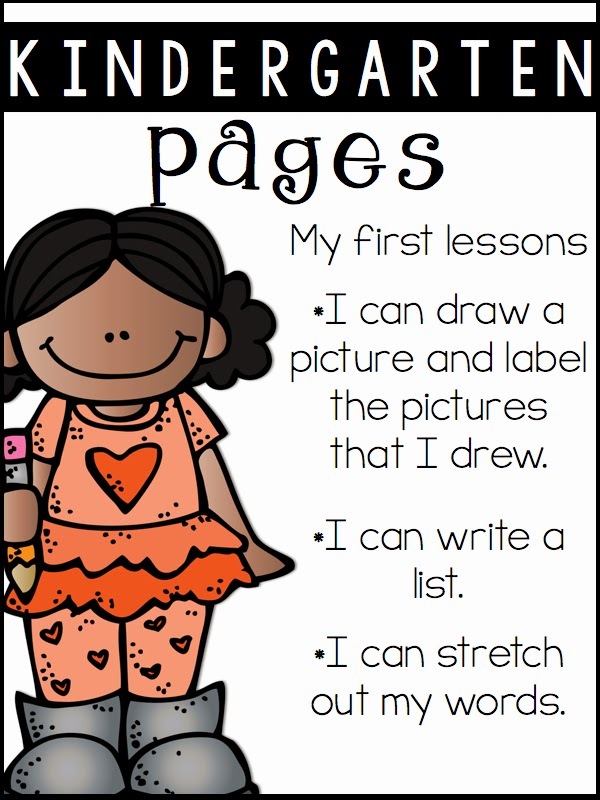 Where most of my kinders will not be able to “write a story” per say at the beginning of the year, they most definitely can draw pictures. This will be my first lesson for work on writing in kindergarten: Pictures convey meaning and drawing pictures is part of our writing process. 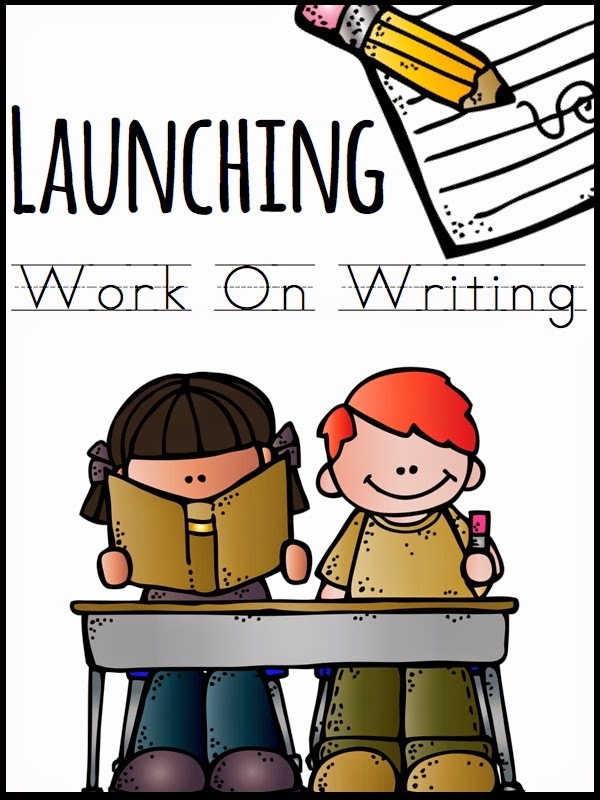 Where as the Sisters suggest launching Work On Writing once your students have achieved 7-8 minutes of stamina in kindergarten, I am going to make sure that I have also taught these mini lessons before letting my kids try this Daily. My writing center is also VERY close to my word wall. This allows my students to use their resources when writing. I love to make my writing center come to life. Target is my best friend when it comes to doing things like this. For October my themes were spiders, bats, and owls. 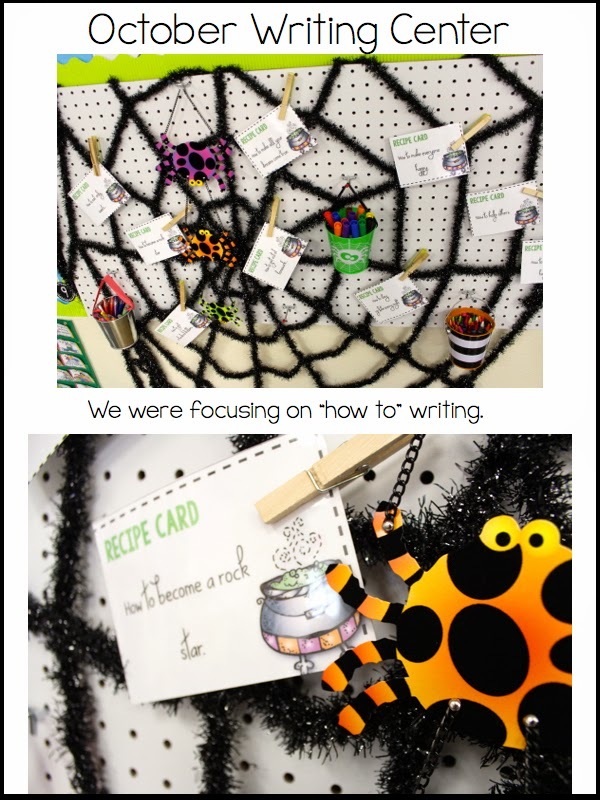 I purchased a spider web in the “Speciality Section” at Target and a few spiders and turned my writing center into a WEB of fun. My kids LOVED this!!! During the month of December, I put a mail box at my writing center so my students could write notes to Santa. Oh my goodness was this a hit! I also added ornaments with writing prompts written on them. In the gift baggies my students found our vocabulary cards for the month. Another “essential” at my writing center are word cards. 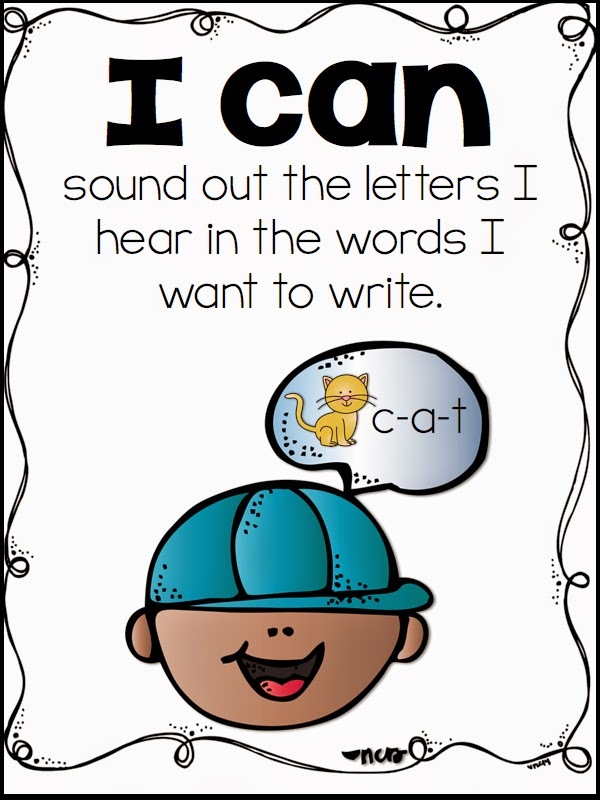 These cards not only inspire my young writers, but it also helps them spell the word they want to write correctly. Another thing that made my writing center really come to life were my write and wipe pages. I created some posters that you can use when you are launching this element of the daily 5. During work on writing, my students do not always get to work at the writing center and therefore, when launching work on writing, we practice sitting all over the room. What do my students write in? I have tried SO many different “vehicles” to keep my students’ writing in. I’ve tried notebooks, journals, store bought writing journals and more. However, the one that really works for me is binders. I like using binders because it is a great way for me and my students to observe the growth they are making in writing. In the binders I use one of my good friend’s writing packet. Lori Rosenberg has a FABULOUS writing resource in which she has key words for each month of the year and different themed papers. I simply print them out every month and have my students put them in their writing binders. My students put them in so they know where they are! When my students do this, they take ownership of their belongings and don’t ask me where the words are! This is a picture of one of my students using Lori’s words to write about the fall. These students are busy working on writing at their desks in their binders. During work on writing my students are free to write about whatever they want to. This boy was writing about the life cycle of an apple. Another reason why I love to use binders is because I dictate how BIG or small the lines are that students are writing on. As you can see from above, this student still needs lots of practice with handwriting and keeping his letters in the correct part of the lines. While I do teach handwriting, I also use word work to practice that skill. That same child from above completed these hand writing cards a month later during word work. His handwriting got better and better with practice! Just like the sisters, I introduce word work last. However, word work looks a little different in my class. I am one of those weird teachers that does BOTH Daily 5 AND Literacy Centers. My students get SO much out of both that I just can’t give either one up. Therefore, most of the time, word work in my class is done during our center times. 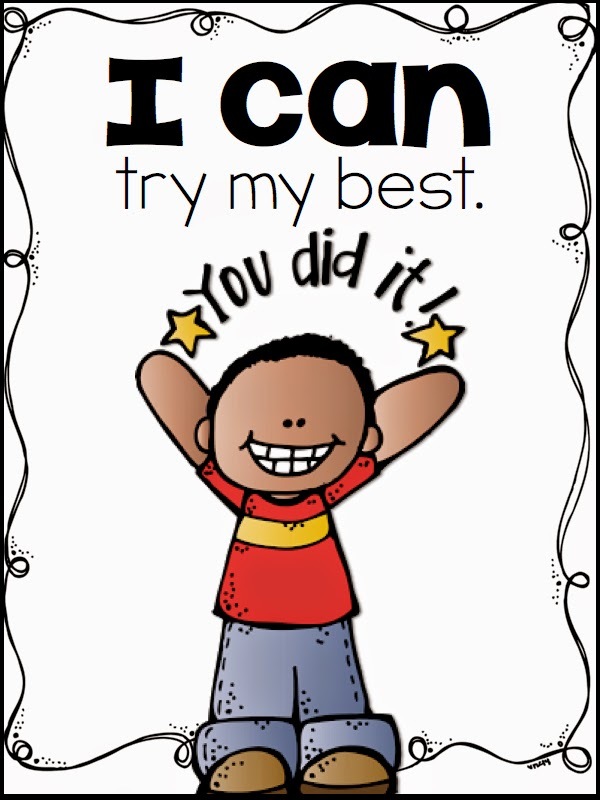 When I introduce my centers I use these posters. We discuss what our center time should LOOK like. We discuss what our center times should FEEL like. And discuss what our center times should SOUND like. 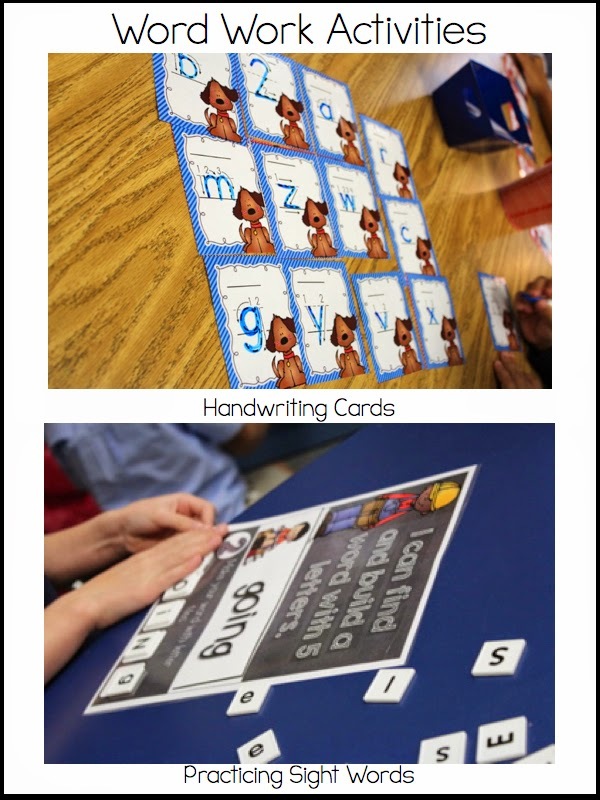 During my literacy centers my students will work on anything from matching rhyming words, putting poems in order, practicing handwriting, sorting by vowel sound, sorting phonics sounds, spelling word families etc. I typically have 4 centers and my students go to one a week. This center time is NOT part of our Daily 5 time and only lasts about 20 minutes per day. During that 20 minutes, I pull a GR group. I schedule my class like this because my students get extra hands-on practice with our literacy skills for the week. 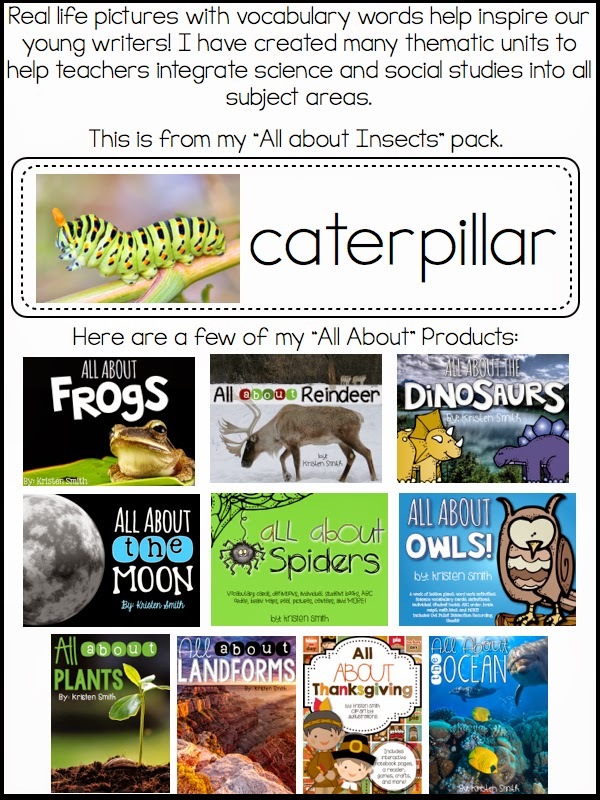 In this pack I include posters, I can statements, student task cards, centers and recording pages to help you get started. 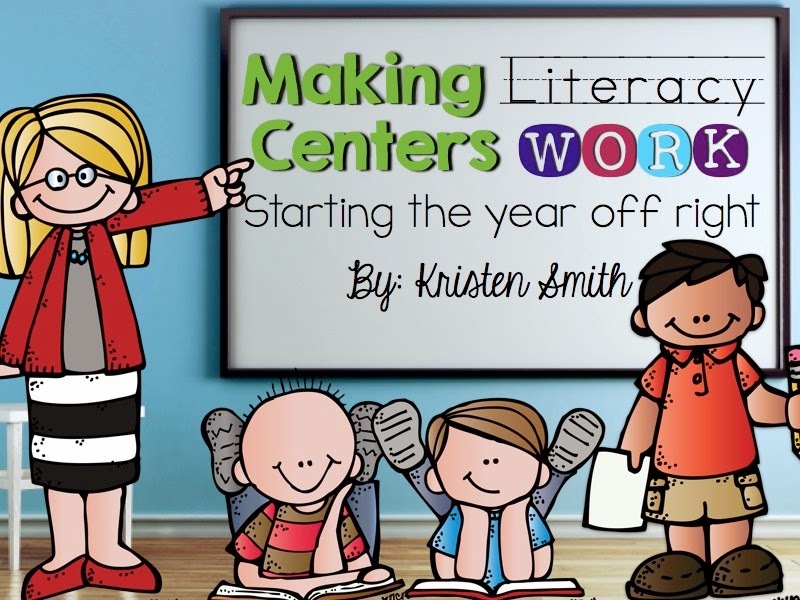 These centers set the tone for my entire year and I was SO grateful for them! I know that your kids would love them too!! I also offer tips on how to keep your centers going! In closing, you need to let your students dictate when to change to the next daily 5. 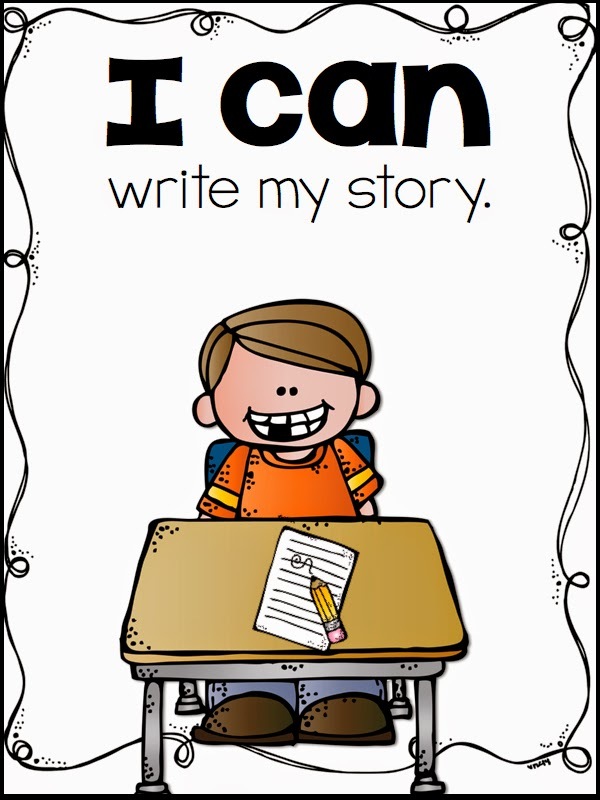 Make sure that they have built up at least 7-12 minutes of stamina and then slowly introduce the next sections of the daily 5 starting with work on writing. Because writing is such an important part of our classrooms, I wanted to spend a little more time focusing on that part of my classroom. I hope that this blog post helped you and that you enjoy the freebies offered in it. As a quick reference here is where you can get everything simply click on the words to get taken to the product or freebie of your liking. OH! And I nearly forgot! 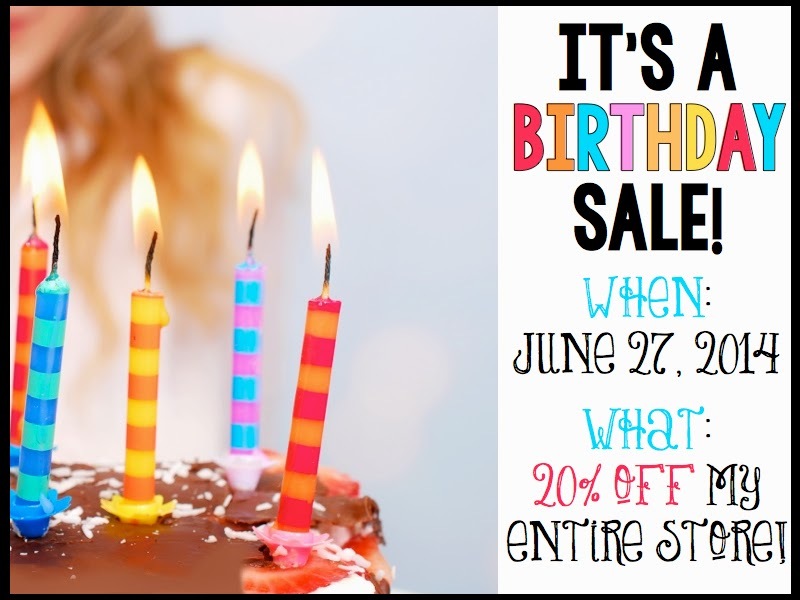 Today is my BIRTHDAY and EVERYTHING in my store is 20% off!! I LOVE your writing center! Thanks for a great post and the freebies! Your writing center is AMAZING! 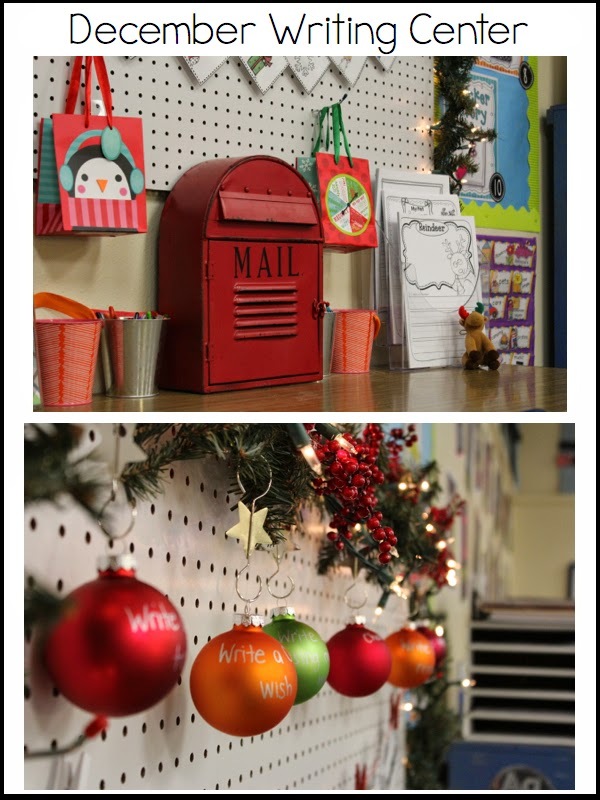 Love the use of the peg board- I had one of those in a former classroom and always struggled with what to do with it. I read this post 3 times. Just amazing! Thank you so much for your freebies and great ideas! Where did you get the awesome mail bin? WOWZA!! Sooo many great ideas!! I will be rereading this!! Thank you for the awesome ideas and freebies!! This is an AMAZING post!!!! Well done my friend. WOW! Thank you so much for this post. Writing is the area that I’m working on improving next year. 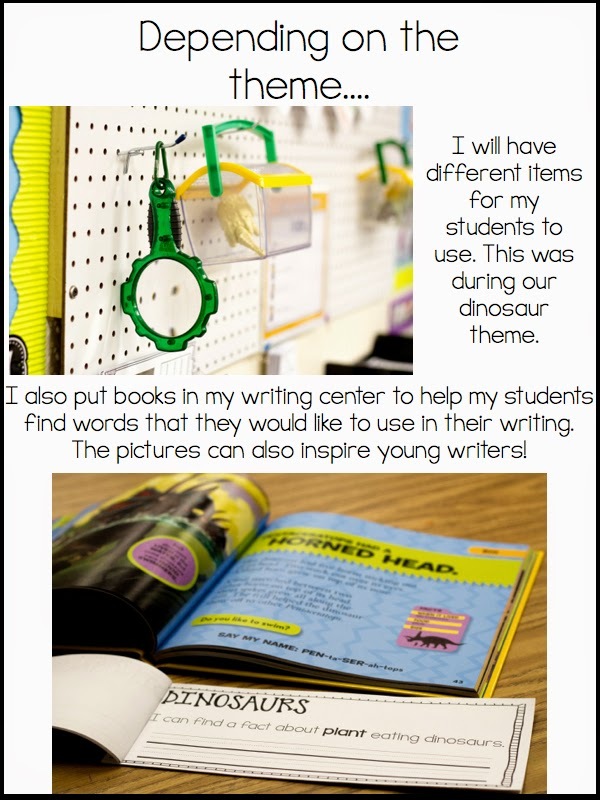 I’ve been completely overwhelmed looking through different writing center packs on TPT. 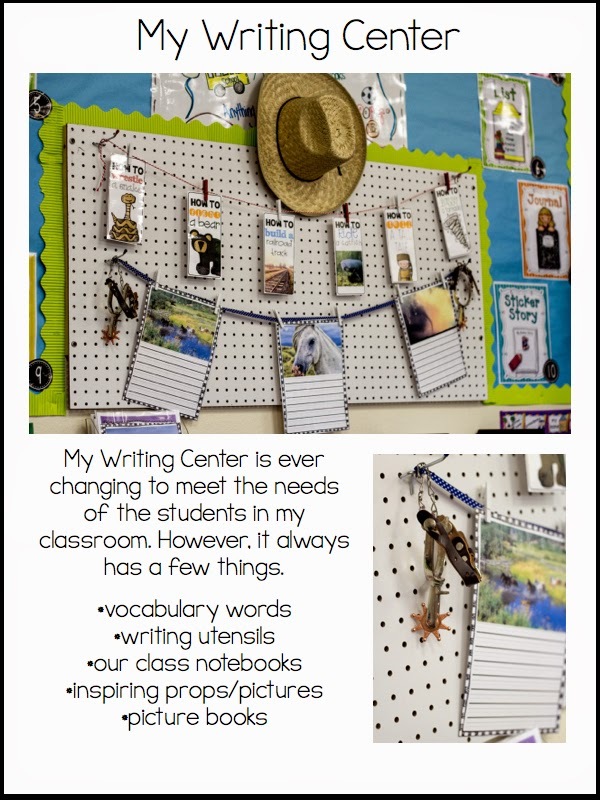 Buuut now that you’ve laid out the basics and how to organize a writing center, I am feeling much more excited to take on the writing center next year! Your writing area looks awesome and I love that you change the theme to go with what the kiddos are writing about. I’ve got some great inspiration now! Thank you again!! WOW. Your student’s writing skills must be above the par. I love the write and wipe sheets. Smile and stop by anytime! Happy, happy birthday! Thanks a bunch for sharing. I’m definitely going to use these. 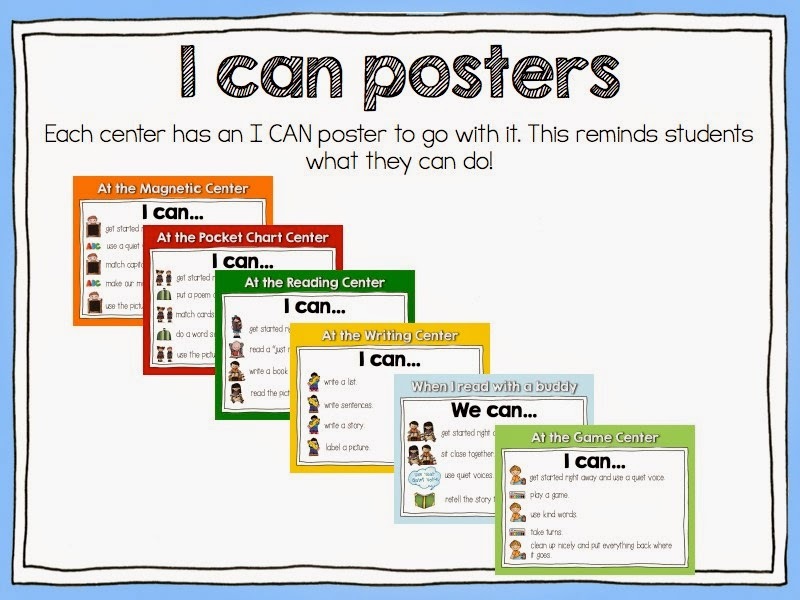 Are the posters you use to introduce your centers part of your Making Literacy Centers Work? I did not see them on the preview. If not, where can I get them? Thanks for all the great ideas! Wow! I am so impressed with this post. Now I’m sitting here wondering if I can get a pegboard to stay up on trailer walls! Happy Birthday! I loved everything in your post. It is something I’m going to try. Thanks so much for sharing. Happy Birthday. Great read Kristen! I love the posters and will be using them for sure! Thanks for the shout out about my monthly writing activities and for sharing such insightful information! Your write and wipe with photos inspired me. I will ask families to bring in or email me a photo of a person, place or thing from their summertime. I can combine it with the lined paper and project it using the smart board (I think) as a way to train the students how to use these and what I expect from them. It will be a fun way to get to know one another and help me see what interests them. It will give me time to laminate the photos and get them into the writing area. If families contribute throughout the year, I can ask for whatever theme we are working on and strengthen the home/school connection. Thank you so much for posting this! I am moving up from Kindergarten to First next year. I loosely followed the Daily 5 last year but have been spending this summer figuring out how it that time will look differently in first grade. I am only going to be a second year teacher so posts like this are SO helpful. Thank you! Wow! Thank you for all the information you shared! I attempted to do Daily 5 last year, I was the only teacher in the building and started it as part of my mentor project all new teachers in CT have to do. My district follows the Writer’s Workshop model by Lucy Caulkins, and I found the writing piece of Daily 5 very difficult trying to align the 2. 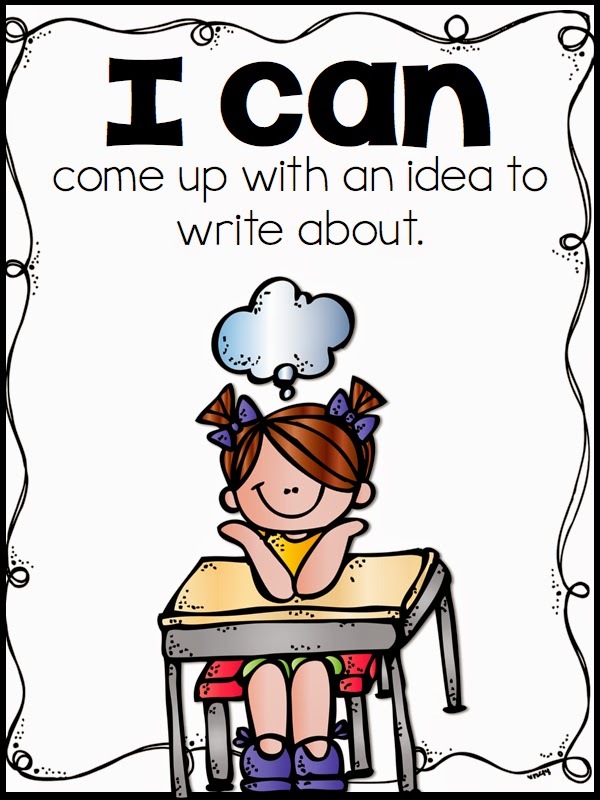 I loved the Daily 5 approach since the workshop model wants 1st graders to write for an hour (minus the mini-lesson). I was curious if any other teachers out there have been in this situation and how they made it work. I adore your writing center! It gives me hope/ideas as I am moving into a classroom that is 1/3 the size I had last year. 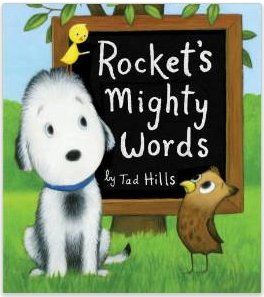 I was not familiar with Rocket’s Mighty Words….purchasing it RIGHT NOW! I found a lot of success in using clip art to help my Kindergartners create a picture off of a sentence for writing last year. For example: He spent his day playing at the beach. I would have as many things as I could think of printed out that could be found in the beach and the water: treasure chests, clouds, pirates, an island, sun, beach ball, etc. I kept asking, “What else could we add?” (Of course I would also include things that wouldn’t work: Santa Claus, snowman, etc. They had so much fun building a scene. I was AMAZED how their drawings changed after that. I always encouraged them to draw first and then write their sentences based on their drawings to enhance the skill of author/illustrator matching in the Common Core. I appreciate your post and your thoughtfulness. 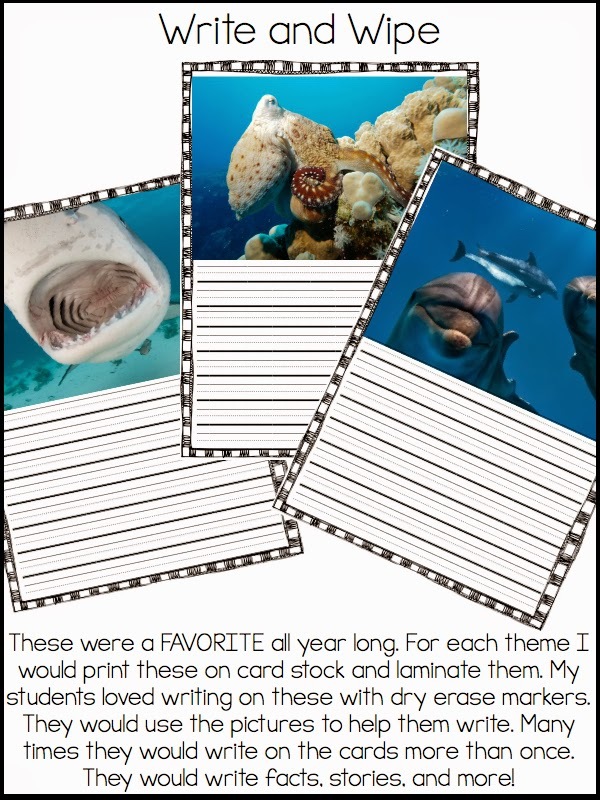 Please come visit me at TPT and at my blog to see if there are any freebies you can use as well. Be blessed. I love the write and wipe cards. I couldn’t find them on your TPT. Do you have them for sale? Thank you! I love the writing center. 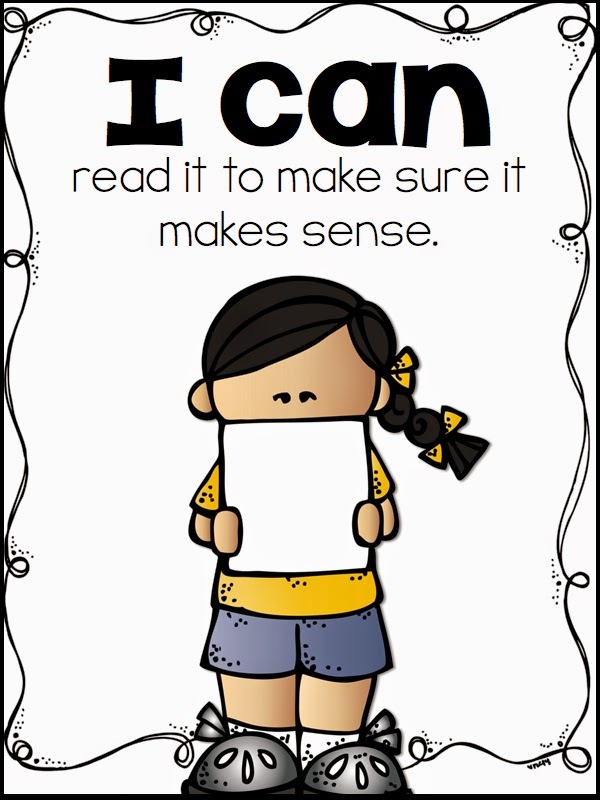 Where did you get the “I can” posters you have in the binder? Hello! love all of your things! How do I get the write and wipe cards, and recipe cards? I have been looking for them on tpt and your website and cannot find them:/ PLEASE HELP! I absolutely love this blog post! I did daily 5 last year and loved it. 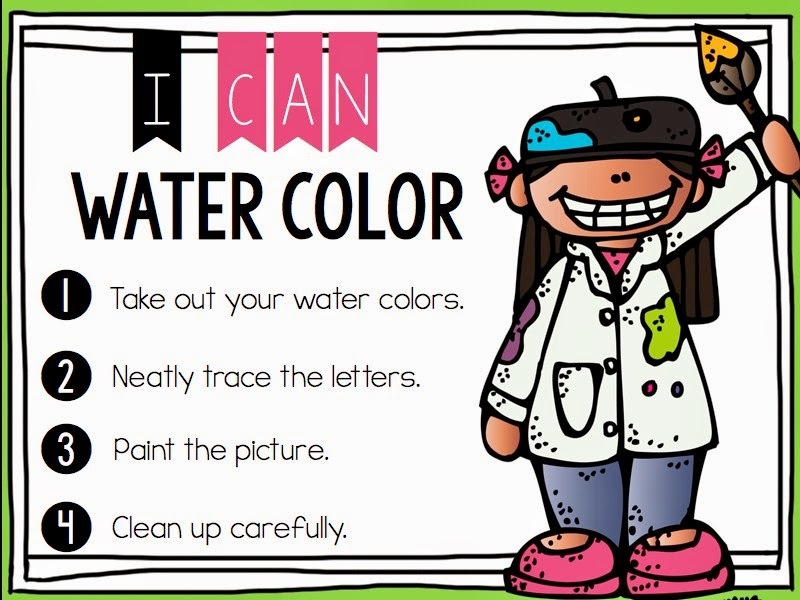 Do you have the write and wipe pages to purchase on tpt?? I would love to get them. I too am looking for write and whip. I love your write and wipe activities. How can I purchase them? Susan, these are all part of my “All About” packs. I will try to put together a separate pack of Write and Wipes though!! 🙂 I’m glad you like them!! Jessica, that is on my list of things to put together! I have them available in all of my “All about” packs but I will be making a separate pack! Hello! I love your page! 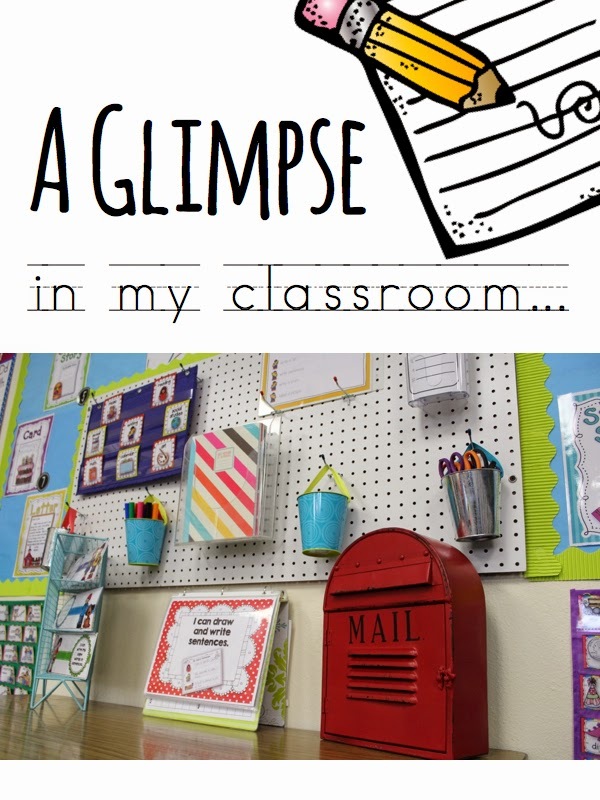 I have looked around for a while and now have lots of things I want to try in my classroom! 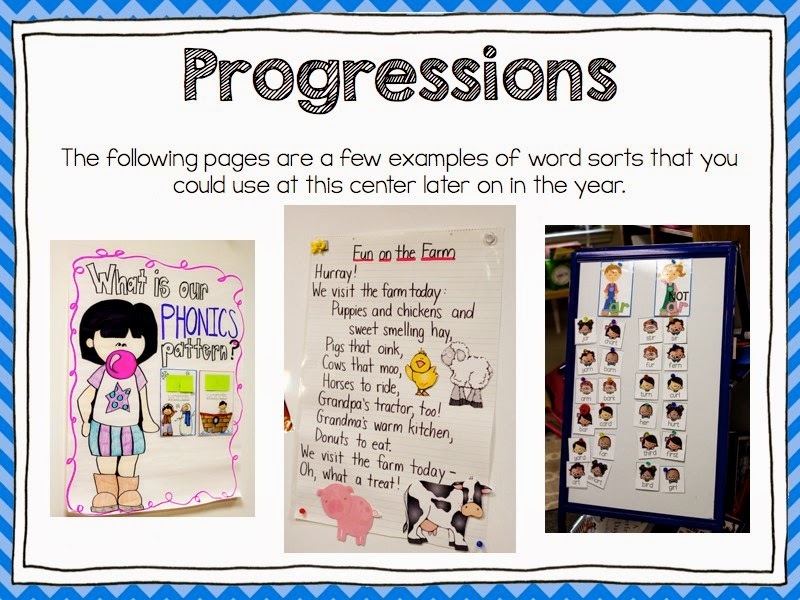 This is my first year teaching first grade and I love your writing centers by theme. I’m confused though on which bundle has the themed writing centers like the October and December writing centers pictured above? I was inquiring about the write and wipe animal pages. Do they come in a bundle? I can’t find them on your store. Thank you so much. Would it be possible for you to post a picture of your work on writing each month? It’s so inspiring.